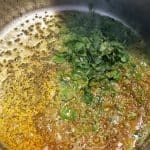 If you’ve tasted butter chicken, you have eaten fenugreek leaves. The flavour is warm, slightly bitter and immediately transports you to the villages of India. 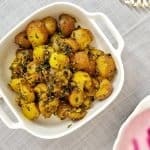 This warm potato salad with turmeric and fenugreek leaves is my secret weapon. The flavours are perfect for chilly days when I yearn for Indian food but don’t feel like putting in the effort into an entire meal. The fenugreek plant is important in Indian cuisine and around the Middle East as well. The seeds and leaves (in fresh form and dry) are widely used in Indian dishes often with potatoes and other spices. They are high in iron and manganese and are one of the few greens that have some protein as well. The fresh leaves have a pleasant but bitter favour that is FABULOUS when combined with some spices, in particular, turmeric and black mustard seeds. 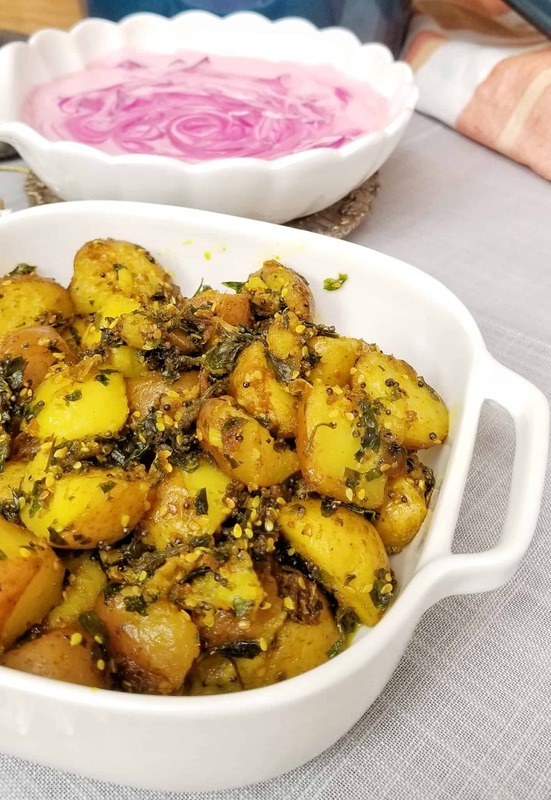 My mom makes a delicious dry dish (sabzi) with potatoes and fenugreek leaves and a host of other flavours. My dish is inspired by those same flavours but has fewer ingredients and as a result, takes less effort. It also has a cleaner flavour so it may be eaten alongside a curry or a pasta, whatever your preference du jour! 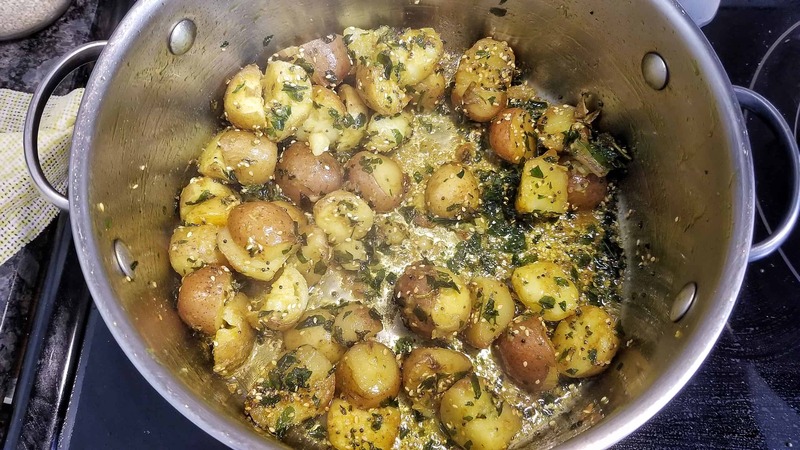 Precook the potatoes on Sunday and you can turn this dish around in 15 minutes on a weeknight. Here are some of my favourite meal prep tips. I use my Instant Pot for my meal prep over the weekend. 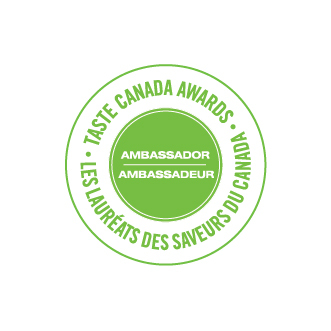 It helps me hang on to my sanity during the week and stave off the temptation of take-out! I have served this dish on a crazy weeknight with plain rice and grilled chicken. Quinoa, steamed fish and this warm potato salad would be amazing too. My favourite feature though was at a potluck dinner party when this dish disappeared first – boy, it was popular! Add the potatoes and stir, gently. 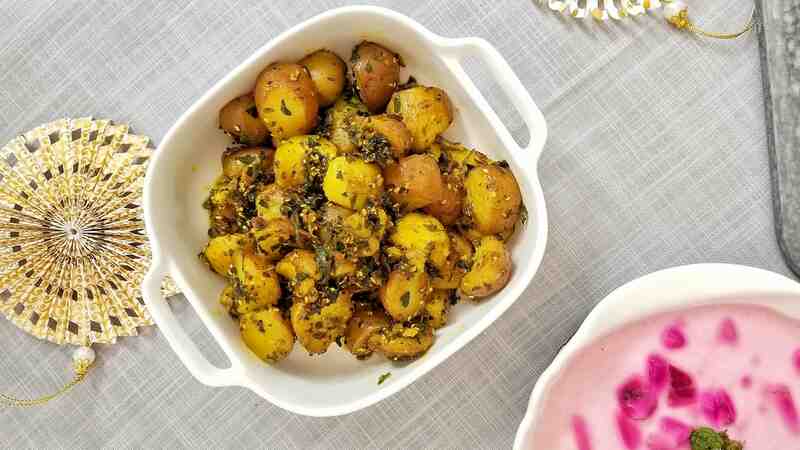 Indian-inspired Potato Salad with warming spices, turmeric and fenugreek. Wash and rinse the potatoes. Wash and rinse fenugreek leaves and snip them off the stems. Chop roughly. They are fairly small to begin with. Trim any eyes or blemishes. Leave the skin on if you like. Cut them into bite-sized pieces and make sure the pieces are even. 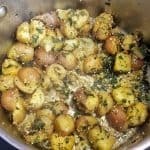 Steam the potatoes in the pressure cooker or Instant Pot. 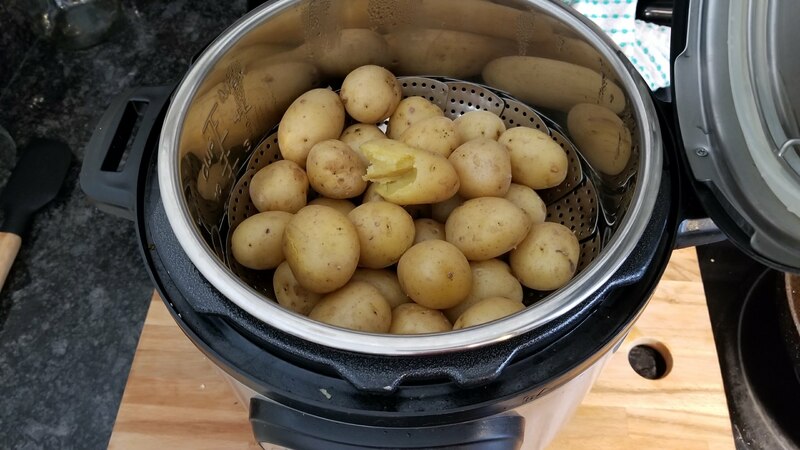 I use my Instant Pot with a cup of water and the steamer insert. Set to Manual 2 mins and leave it to NPR for 5 mins. All oil to pan and let it heat. Add mustard seeds and wait for them to start popping in the hot oil. Add the turmeric and toss the spices around. 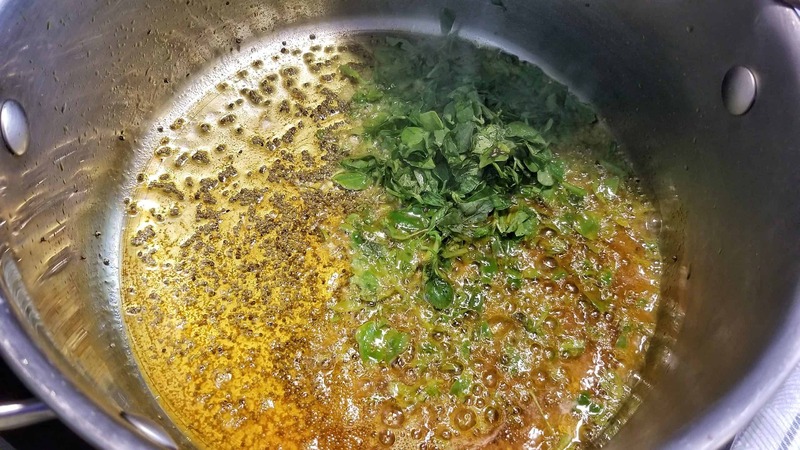 Add the fenugreek leaves and toss in the hot oil. Add sesame seeds. Add potatoes in the pan and toss gently. Try as far as possible to let the potatoes just sit. They are already steamed so you don’t want them to fall apart and become mush. Add salt and sugar and let the potatoes get some colour on them. « What is your favourite food memory?